I would like to thank every single person who was so kind to visit my blog and I would like to thank every single person who entered into the competition and/or left me a comment... you all have been so very kind! 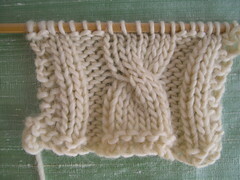 Better yet, I prefer to work with no cable needle at all... but that I will save for another post, because I am afraid I will confuse the novice knitter! The next step feels "weird" at first because now you are actually going to make that twist we were talking about earlier. 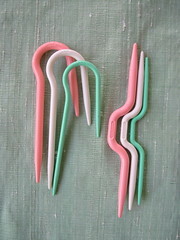 By doing so, you have made your first twist. 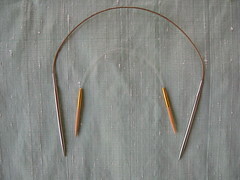 Now put that cable needle away for a little bit untill it is time to use it again! 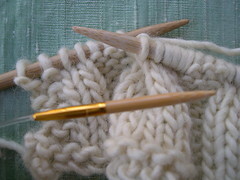 Until it is time to twist again and you repeat the steps with cable needle. There, that is all there is to it! 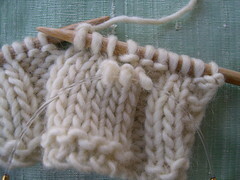 For more cable tutorials go to: Knittinghelp.com and watch Amy Finlay's excellent tutorial video on cables! 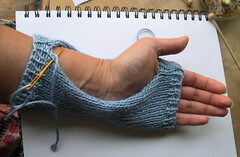 You will find it in the "Advanced Technique" tab and then go to "decorative stitches". 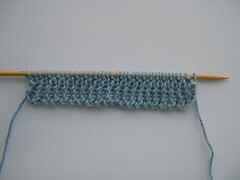 I learned how to do cables from Amy's video. For several nights I was occupied with it until I was completely satisfied. 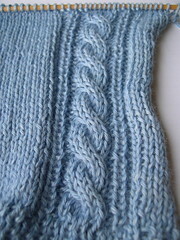 I have knit this pattern with several yarns: debblie bliss pure silk, Debbie Bliss Alpaca silk DK, artyarns beaded silk and Misti Alpaca DK. 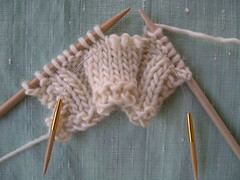 For the pattern please go to the pdf file. 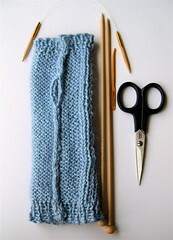 Next is a step by step picture tutorial to give you an insight and to show you that as a newbie knitter, you need not to be intimidated! 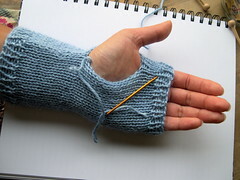 Step 4: Seam that glove! 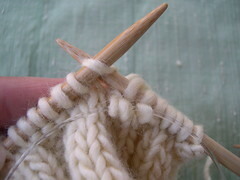 Start to seam at the top of the glove. 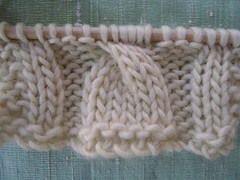 The seaming technique I used is called the mattress stitch. 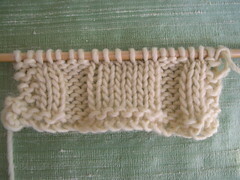 Remember when you ribbed for 4 rows? That is your top. So start there. 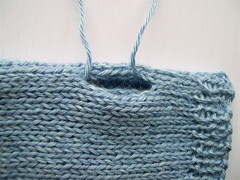 If you don't know how to seam, go to knittinghelp.com and watch Amy Finlay's excellent video tutorial on the mattress stitch. 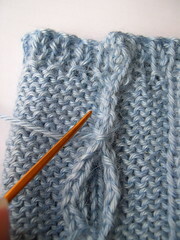 Scroll down her page untill you hit the "finishing" section and click on the mattress stitch! There! That is all there is to it! Now that wasn't that hard, was it? Woooohooooo! I am soooo happy to share this with you all!!! 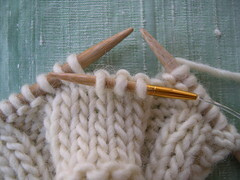 Happy knitting..! Submitted by MontazhGrels on Wed, 02/08/2017 - 04:59. 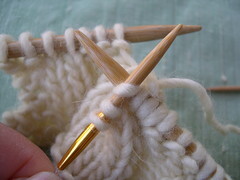 Submitted by Anonymous on Thu, 01/31/2013 - 23:46. 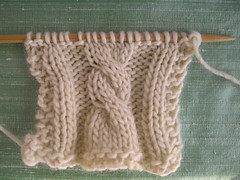 I am a beginning knitter... i've never tryed cables before. Now that you've shown me how easy it is... i'm going to go cable CrAzY!! Submitted by Anonymous on Thu, 06/05/2008 - 23:14. Submitted by Anonymous on Tue, 07/10/2007 - 20:06. Submitted by Anonymous on Tue, 05/22/2007 - 06:11. Submitted by sdreifuss on Sat, 05/19/2007 - 18:03. 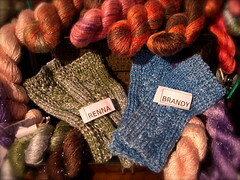 Thanks for commenting on my blog and enterinbg my contest...GREAT NAME for those stitch markers....I might have use that! Submitted by renna on Sat, 05/19/2007 - 04:38. Submitted by olives.8 (not verified) on Sat, 05/19/2007 - 03:42. Submitted by irisknits on Fri, 05/18/2007 - 23:50. Hey Nancy, that's so lovely ;-). A great tutorial I'd say, very informative. Keep up the good work! Submitted by DLayman on Fri, 05/18/2007 - 23:07. Submitted by thdx333 on Fri, 05/18/2007 - 11:14. Submitted by sdreifuss on Fri, 05/18/2007 - 00:20. 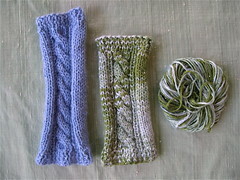 Oh well, I didn't win...but I love to play knitters blogs contests- Congrats to those who won and kudo's to you for having such a nice contest. 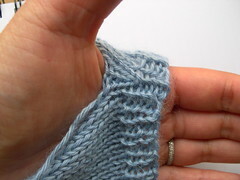 Now will you please go to my blog and enter my contest....pretty please? Submitted by renna on Thu, 05/17/2007 - 23:10. I am simply THRILLED to have won the Denaedin's. I'd have been thrilled to win EITHER pair, as they are both so beautiful. I feel like it's my birthday. I can't thank you enough. 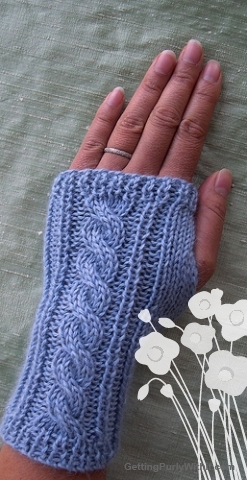 I can hardly wait to sit down with your pattern and tutorial and try these myself. 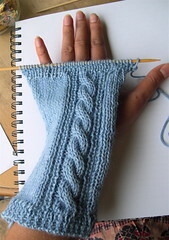 I wish all knitting patterns were written the way you've written this, along with the pictures. Submitted by Anonymous on Thu, 05/17/2007 - 22:58. Submitted by court on Thu, 05/17/2007 - 22:33. That is just amazing! I don't think that I could do it in a million years! I really admire people that can though.